Gerry’s ambition was to become a portrait painter. آرزوی گری این بود که یک نقاش پرتره بشه. ▪ painter someone who paints pictures: the Dutch painter, Johannes Vermeer | Sisley was principally a landscape painter. ▪ potter someone who makes pots or other objects from clay: In Spain, local potters produce ceramics with beautiful brightly-coloured designs. ▪ sculptor someone who makes ↑sculptures (=a work of art that is made from stone, metal, or wood): The museum has several pieces by the great English sculptor, Sir Henry Moore. 3. a rope fastened to the front of a boat, used for tying it to a post, ship, etc. • He now works as a painter and decorator. • Chardin was a gifted still-life painter. • Pablo Picasso, the famous cubist painter, was born in Malaga. 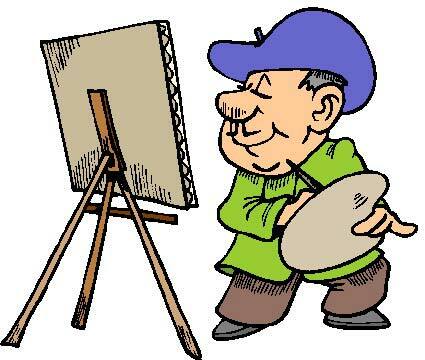 1) N-COUNT A painter is an artist who paints pictures. 2) N-COUNT A painter is someone who paints walls, doors, and some other parts of buildings as their job.